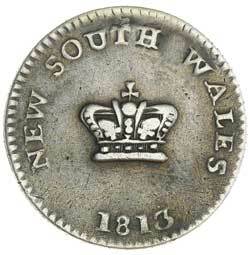 NEW SOUTH WALES, fifteen pence or dump, 1813 (Mira dies A/1). Traces of reverse of the host coin on the reverse, trace of mounting at top of the obverse, skillfully repaired, otherwise very fine, with excellent eye appeal for this rare type coin. 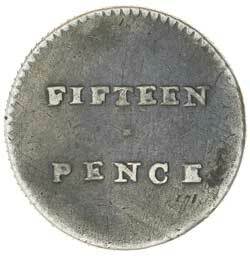 Ex Noble Numismatics, Sale 105 (lot 1278).